People plant vegetables gardens in their back yards for two reasons, either because they feel an urge to till the soil and produce food for themselves and their families or because they have discovered that only by raising their own vegetables can they enjoy superlative flavor, succulence, nutritive value and healthfulness. Undoubtedly vegetable gardens are occasionally started because the racks of colorful seed packets displayed in all sorts of stores every spring arouse a temporary enthusiasm to “dig and delve,” but such gardens usually deteriorate rapidly as soon as the weather becomes hot enough to spoil the fun. In the rare cases when such gardens are faithfully cultivated throughout the season, it becomes obvious that they were actually planted for the first reason mentioned. Unless you really want to eat better vegetables than you can ordinarily buy, there is not much sense in saddling yourself with a back yard vegetable garden. 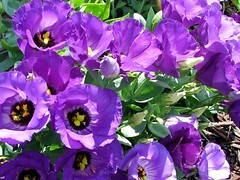 There are easier ways to obtain outdoor exercise or to satisfy an urge to growing plants in containers or in a garden. When weather conditions are favorable flower seeds can be sown outdoors. The topsoil should be raked level and all stones, clods, and roughage raked from the seed bed. Make sure that the topsoil is raked thoroughly so that it is quite fine and into- this sow the seeds in drills. Cover the seeds not more than three times their depth and firmly light. Water with a fine spray. Thin the young seedlings when large enough and cultivate. 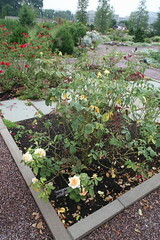 Those that are thinned out can be transplanted along the row or to some other part of the garden. A few flowers due to the nature of their root system are not adapted” totransplanting, however, as a general use most kinds will transplant without difficulty. For the purpose of simple classification Flowers are divided in three groups; Annuals, Perennials and Biennials. Annuals flower the first season, ripen seed, then die. As a rule Perennials blossom the second year from seed and thereafter continue to live for an indefinite number of years. Biennials as a rule require two years to blossom. They are short lived after that time. Unlike annuals, perennials are more or less permanent, flowering annually from the same plants, and do not require to be resown or replanted each season. Seedling perennials, as a general rule, are more vigorous than plants propagated by means of divisions, cutting, etc. They need a longer period of growth to come to maturity than do the annuals, and may be sown from early spring to early autumn, according to their various requirements. A fairly rich and well prepared seed bed should be made in a sheltered and sunny position, and the seed sown thinly in drills, watering the drills before sowing if the soil is dry. As a rule, no further watering is necessary, but should a dry spell set in when the plants are tiny like the dwarf banana, it is wise to water them as they need it. Keep free from weeds and pests, and when large enough to handle transplant them carefully to a bed. In October, or alternatively in early spring, according to the size of plants and weather and soil conditions, move them to their permanent quarters. When planting Peonies plant as soon as they are obtained, being careful to set the division so that the top of the buds will be from 1-1/2 to two inches below the final soil grade after the plants are watered and have finished settling. If planted too deep you will probably get pretty foliage with a few or no blooms, and if too shallow, the buds will be exposed and are likely to get broken off by Old Shep when he serves notice on a stray cat or rabbit. You should expect blooms from three to five eye divisions the first season. Only seven of the 60 varieties I planted in my garden a few years ago failed to bloom the first year. The plants made a splendid display of flowers the third season after planting. Digging and dividing large, old peony clumps is no easy task, as most gardeners have learned. If the freshly-dug clump is left exposed to the air for a while, the roots will become less brittle and are more easily handled without breaking. The soil which is tightly held by the roots is best removed with a stream of water from the hose.